I have been using expandable broadheads off and on for years. There are several reasons that I like this kind of broadhead. They fly like a field point which means no need to adjust the site pins. This will allow you to simply screw on the broadheads and go out after the deer. 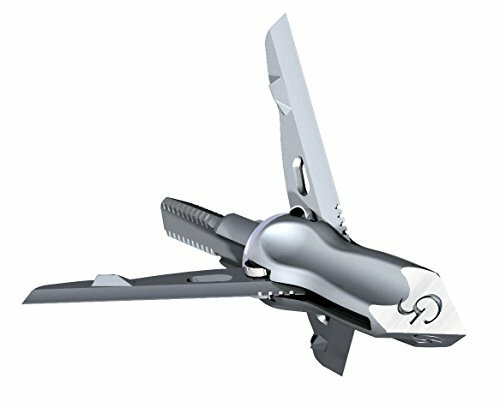 These expandable broadheads also have a larger cutting diameter than fixed blade broadheads. This means there will be a larger wound and a faster kill and recover. There is no need to align vanes or feathers with the blades of the broadhead. There is almost no chance of the broadhead planning as the arrow flies to the target. When expandable broadheads first came out there were some problems, the biggest was they simply didn’t open up. I shot a four point buck with one of these broadheads. Only one of the three blades opened. I also didn’t have an exit hole. The deer ran 45 yards before it died. There were many reasons the blade did not deploy. The biggest reason was there were too many moving parts. They were also made out of weak metals that would cause the broadhead to bend or break. One of the biggest problems with today’s broadheads is deflection. This happens with top expanding broadheads. When they hit a target at an angle the blades will deflect the arrow before the tip of the broadhead hits the target. The deflection could be as long as the length of the blade. However there are good performers on the market, and we’ll have a look at them. 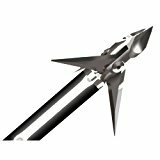 We are reviewing the rear deploying Rage SlipCam Expandable Broadheads. 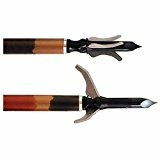 There are two different styles of Rage SlipCam Broadheads. They are available with three blades or two blades. 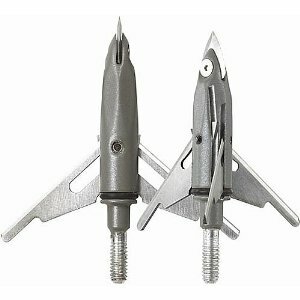 The two blade broadhead makes a huge 2” diameter entry and exit hole. 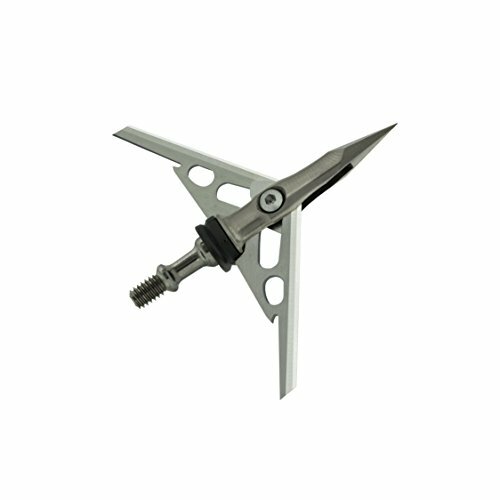 The three blade broadhead has a 1.5” cutting diameter. The three blade broadhead makes a smaller hole but has more cutting surface. It will open with less kinetic energy than the two blade version. If you have a low pound or a short draw length then it is recommended that you use the three blade version. I like the three blade broadhead because they cut the hide in three different directions. Each blade is 33 degrees away from the other. The three blades make the game bleed better. This will make it easier to find the animal after the hit. 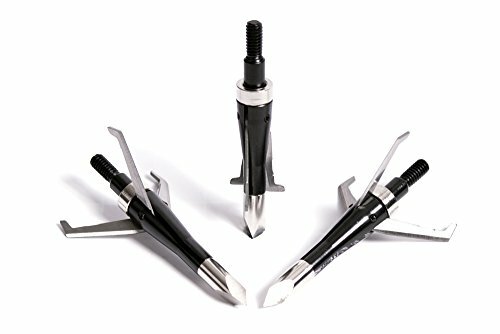 While I recommend the three blade system for deer hunting, I will be using the two blade broadhead for turkey hunting. I feel that the bigger cutting diameter will be very useful for turkeys. Unlike deer or other big game, you want to put that bird down right in front of you. The best way to do this is to break the wings or legs. This will prevent the turkey from flying away and the turkey will bleed out fast. 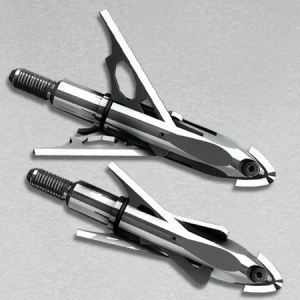 The Rage Broadhead comes with a practice head. 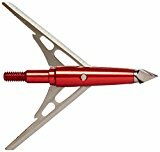 I have always felt that every broadhead on the market should be sold with a practice head. This way you can go out and shoot your broadheads without dulling the ones you will be hunting with. The most important aspect of any broadhead is how it works. You want the broadhead to open as it hits the animal. You don’t want the broadhead to open before it hits the game. This broadhead meets and exceeds our expectations. I’m a declared fan of this broadhead. If you’re going shopping for some reliable and accurate expandable broad heads, but don’t want to pay too much, take a leap of faith with the Carbon Express Torrid SS Broadhead, 85-100 Grain Adjustable Weight. The broad heads have a 3-blade expandable design, ensuring higher cutting performance. They come with Trocar, a hollow-ground chisel point, whereas the collar has weight adjustment for 85 or 100 grain broad head. You may also use it as a stop washer. The ferrule is made with aircraft-grade aluminum, which explains its power and efficient penetration. Going through the numbers, we notice the 1.5” cutting diameter, the 0.031” blade thickness and the 85-100 grain weight. You get 3 broad heads in a pack that fly just like a field point. They are versatile and you may use them for compound bow, recurve bow, and crossbow as well. The broad heads leave devastating holes and are reliable out on the field. Let’s not forget the low price that recommends them as a good choice for any tight budget. All in all, for a low price, you get reliable, accurate and pretty good broad heads that may serve you well in many situations. 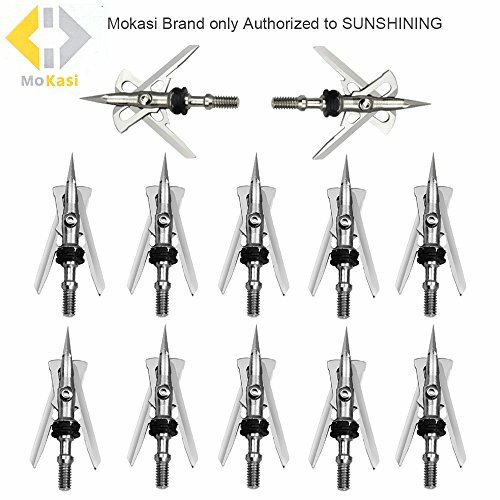 The MoKasi 12pcs Archery Official SlipCam Broad heads are quite a good surprise from many point of views and they manage to give accurate performance, even though they’re not very expensive. The broad heads come with an aerodynamic ferrule for more field tip precision and present a cut on impact leading blade. The blades are made of stainless steel so they’re quite sharp and strong, whereas the shock collar minimizes risk for premature blade deployment. Each broad head comes with 2 O-rings and the exclusive tips are hybrid style. They are recyclable and the field testing is minimal. The numbers may give some info for the experienced hunters and it’s good to know that the cutting diameter is 2” and the length is 6.0cm. The broad heads deploy very well and, more important, remain deployed. The entrance wound is more than 2” wide and the broad heads are accurate. They all weigh the same and take a beat pretty well. Nevertheless, for their performance and good build, we’d say the broad heads are quite a steal for the price! 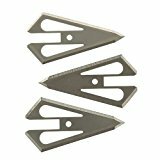 Fast and efficient, the Swhacker Set of 3-100 Grain 2 Inch Cut Broad heads have only big one major flaw: you still have to shoot a crossbow! Joke aside, the broad heads are well made and are quite reliable out on the field. The blade is .032” thick and it’s made with stainless steel, honed razor sharp. The ferrule is made with anodized aircraft aluminum, whereas the point is durable and tough, being made of hardened high carbon steel. The set includes 3 broad heads that are 1in wide closed and 2 in wide open. The numbers also tell us that the ferrule’s diameter at insert is .325” and that the screw is 4-40x.250 grade 8steel. The design is great and the broad heads have two separate cutting edges. The first set of edges (more popular known as “wing blades”) are useful for cutting the hide and the first set of ribs. They also work for opening the broad head, being way smaller than the main blades. As they cut through the dirt, hide, hair and bones during entry, they do take the most punishment. The smaller blades don’t need all that energy for cutting through the first side. They give a load bearing surface for the ferrule during impact. In the case of the second set of edges, the main blades don’t actually touch anything during the first penetration. The edges are still “virgin” when they open in the body cavity. This is how the main blades are still going to be extremely sharp for the internal organs. Flying great, the broad heads do their job fast and efficient most of the time. Despite the minor issues, the set is reliable and works great, as long as you know how to use a crossbow. Aerodynamic and accurate, the Rage Hypodermic is a great broad head to try with your crossbow. The broad head presents an aerodynamic one-piece steel ferrule and razor sharp stainless steel blades. The blades are strong and .035” big, whereas the cutting diameter is 2”. It’s a 100grain broad head though that comes with improved Shock Collar Technology, for better blade retention. We all know practice makes perfect so you also get a free practice head so that you may improve your skills before going for the real, live action. 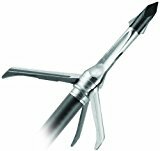 The hypodermic broad head presents a special hybrid tip that has quite a surgical precision. The design is compact and aerodynamic, ensuring more penetration. The hybrid tip gives the accuracy, whereas the chisel tip presents an impressive bone crushing performance. 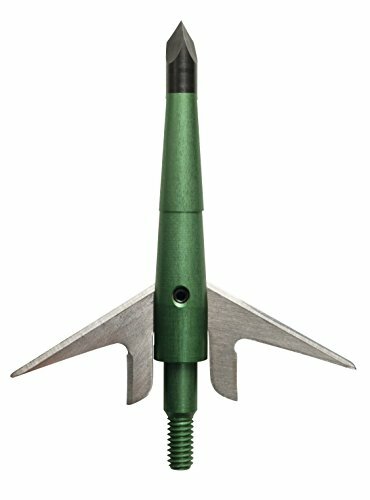 The broad head comes in standard and deep six models and you may use it with standard inserts. If flies straight and deploys consistently every time. It carves huge wound channels and doesn’t rattle. It leaves a big gaping hole and it’s highly accurate. All in all, the broad heads are still of great quality and highly accurate, flying straight every time. Creating a large entry and going through the cage, the G5 Outdoors T3 Crossbow Broadhead (3-Pack), 100 Grain present reliable performance and take the intense use. The blades are sharp and expandable, ensuring maximum cutting area. The broad heads are all made of steel and their build is tough, leaving a durability feel. The broad heads keep the flight profile of a field tip, but cause an amazing damage due to their 1-1/2 in cutting diameter and the full pass-through when used with most bows out there. The design of the broad heads is well thought out and the spider clips let you pre-tune blade deployment the way you want. You don’t need to worry about pre-deployment or any O-rings, as well. They are compatible with shoot-through mesh and each pack includes three broad heads. You also get practice tips and the broad heads really impress with their sharp blades and the design as the blades slide back when deployed. All things considered, the broad heads have a tough build, a smart design and are very sharp, which is what you want the most when out on the field.